NASHVILLE, Tenn. (March 14, 2017) – Few artists have left a more indelible mark on America’s musical landscape than Charlie Daniels. 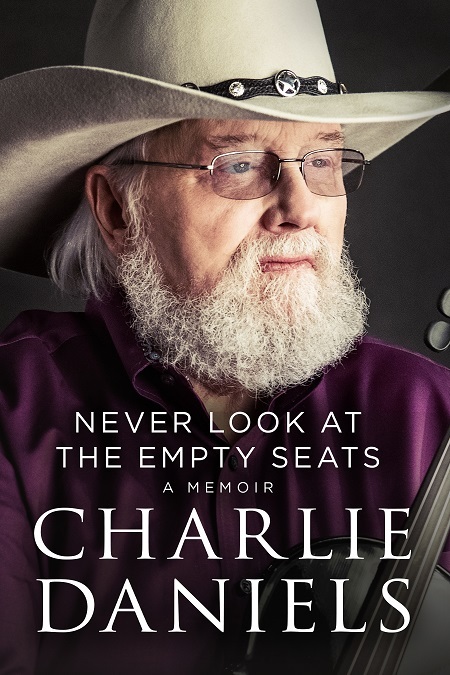 In his official memoir, “Never Look at the Empty Seats” (W Publishing Group, an imprint of Thomas Nelson), fans will learn about his rise from a post-Depression era childhood to becoming a Grammy award winner and Country Music Hall of Fame inductee by focusing on the positives in life. Spanning a career of nearly 60 years, Charlie will share inside stories, reflections, rare personal photographs plus make available lessons learned and sage advice to those seeking a career in the music business. The book releases October 24 in hardcover, eBook and audiobook and is available for pre-order now. For available retailers and more info, go to CharlieDaniels.com. "I'm extremely excited about the release of my new book, “Never Look At The Empty Seats.” Quite a bit is known about my public life but there is so much more I've wanted to share, my early years, my faith, my struggles and the unique people and events which have had such an impact on who I am and what I do,” said Daniels. With a career spanning nearly 60 years and exceeding 20 million in sales worldwide Charlie Daniels is the quintessential Southerner with a healthy dose of Wild West Cowboy. For decades, he has connected with his millions of fans in the varying genres of music that reflect his steadfast refusal to label his music as anything other than the "Charlie Daniels Band" sound — music that is now sung around the fire at 4-H Club and scout camps, helped elect an American President, and been popularized on a variety of radio formats. Having celebrated multiple GRAMMY® Awards, CMA Awards, ACM Awards, BMI Awards, GMA Dove Awards, CCMA Awards, his list of accolades is broad; the latest being the newest inductee to the Country Music Hall of Fame. Several of his albums have been RIAA Certified Multi-Platinum® and he has achieved a platinum-selling single in his iconic fiddle-ridden hit, "Devil Went Down To Georgia." An outspoken American Patriot and strong supporter of the U.S. Military, Daniels' talked-about Volunteer Jam concerts are world-famous musical extravaganzas featuring artists like Lynyrd Skynyrd, Ted Nugent, Trace Adkins, Alabama and others, all on one stage for one purpose – to raise funds for our U.S. Military. Daniels 80th Birthday Volunteer Jam in 2016 raised funds for The Journey Home Project, a non-profit veterans assistance organization which he co-founded. For more information on Charlie Daniels, please visitwww.charliedaniels.com. Thomas Nelson, a division of HarperCollins, is a world-leading provider of inspirational content and has been providing readers with quality life-changing product for more than 200 years. The publishing group provides multiple formats of award-winning Bibles, books, gift books, cookbooks, curriculum and digital content, with distribution of its products in more than 100 countries. Thomas Nelson is headquartered in Nashville, TN.